Every Tuesday, we bring this community of like minds together to bring you an OMazing Sound Bath, and an affordable Holistic and Accessible Holistic Health Fair with an array of the best Healers, Bodyworkers, Psychics, Readers & more. Bringing you a touch of sound healing vibrations, and a whole lot of energy for you to recharge and be charged up for the week ahead. Can’t make it? Join from your home anywhere in the world! Register in advance for this Love Donation Based webinar. Holistic Fair 4:30 – 7:30 PM. Free Entry. Sessions $1 Minute. Packages available, save $25! 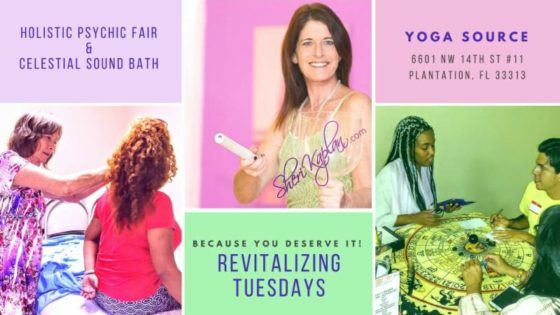 Choose from our Tuesday Revitalization Healing Buffet of Restoration and rebalancing, providing alternative positive approaches for healing, direction, and self-care for body mind and spirit: Iridology, Reiki, Akashic Records, Thai Yoga Massage, Energy Healing, Massage, Intuitive Psychic Readings, and more by top Practitioners, Healers, Psychics, Readers & Lightworkers. Followed by Candlelight Sound Healing Meditation. 8:00 – 9:00 pm. $15 admission or Yoga Source Class Pass. We use a wide variety of ancient sound healing instruments including two Paiste planetary tuned Gongs, four Singing Crystal Bowls, 17 Tibetan bowls, djembe and heart drum, two Tank Drums, at times a Didgeridoo, flute and more create a sound healing experience that will vibrate and activate every cell in your body, leaving you feeling refreshed and rejuvenated. Musicians change weekly, it is never the same! We welcome new musicians!